determine availability of vulnerability fixes for CentOS separately from Red Hat, correcting for fixes that are available in Red Hat (RHEL) but not yet available for CentOS (e.g., CVE-2016-6662 affecting mysql and mariadb packages). No action is required for Datagrid clients and API users; Plesk extension users will automatically start receiving the correct availability data immediately. As soon as CentOS fixes become available, the they will show up as available in the Plesk extension and, if auto-fix is enabled (VCTR Pro only), the fixes will be applied. Note that CentOS and all other major Linux distros distribute their packages through multiple repository mirrors and these mirrors take some time - typically well under 24 hours - to synchronize. As a result, once a fix becomes available, it may take several hours for it to become available for installation. When automatic vulnerability fixing is enabled, the VCTR Pro extension will automatically retry so that once the updated packages do become available on your mirror, they will be installed. eliminate false positives for old kernel-devel packages on CentOS/Redhat: vulnerabilities will be reported only against the kernel-devel package that matches the version and release of the currently running kernel. No action is required for the Datagrid clients and API. Updated the RHEL 6 and CentOS 6 vulnerability sources with a new repository path following the Red Hat Software Collections (SCL) repository change and the corresponding CentOS 6 SCL change. Note: If you use the SCL yum repository, you may need to change the repository name so that you will be able to update packages. See this CentOS bug and this CentOS forum post for more information. 0.0 Unknown severity level, e.g., for new and not-yet-published vulnerabilities Review/find more information to decide on update action. As we compile information from multiple sources, in many cases we can provide more info and severity eval even before details are published in the NVD databse. Added a new option for tracking multiple generations of containers as a single system by matching container's name. This behavior can be enabled on a host by host basis in the standalone client. For the standalone client, use advoptions=dgri_id_by_name on the dgri-report-setup command line or add a advoptions=dgri_id_by_name line in the /etc/dgri-report.conf file. For the ansible client, add advoptions : 'dgri_id_by_name' line in the /etc/ansible-dgri-modules.conf. Added a new advanced option, dgri_allow_pkg_fail, that allows for system telemetry data to be sent even if we fail to collect list of installed packages. This is useful for OS distros without a package manager (e.g., CoreOS) or those with not-yet-supported package manager (e.g., Alpine Linux). 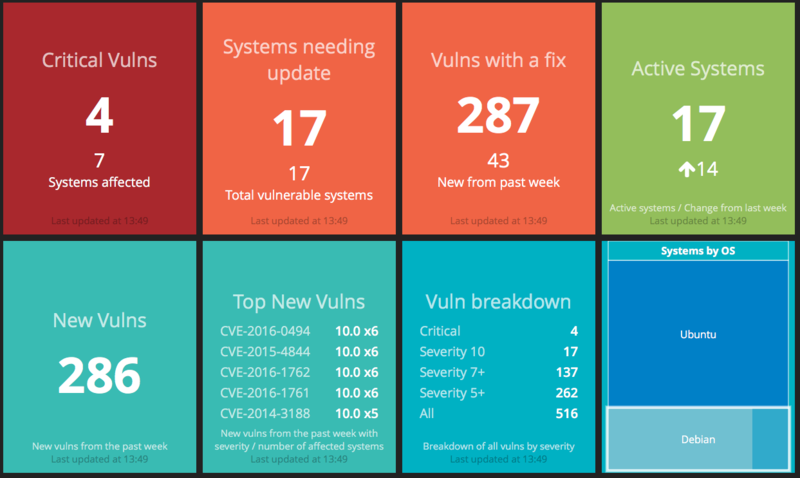 The account dashboard is an open source web app that provides at-a-glance information about your infrastructure, vulnerability status and actionable items to reduce your security risk. It is packaged as a Docker container to make it easy to deploy and maintain. Fork it and modify it to fit your needs, whether they are to get different Datagrid data or integrate it within your existing dashboards and monitoring systems. If you make any changes you think will be useful to other Datagrid users, please send us a pull request. Using Zapier, these notifications can trigger a variety of signals: send e-mail, SMS, Slack/Hipchat, open a ticket, etc., as well as call a REST webhook. The Datagrid VCTR app in Zapier is in beta; you can add it to your Zapier account by visiting the Datagrid Preview app at Zapier. Added tracking of vulnerability's last changed date/time, allowing queries for "recently changed vulnerabilities"
Queries via the API and CLI tool now include only systems that have reported recently (last 3 days); data for older systems can be retrieved either by system ID or by using explicit system.last_signal filter. To include all systems in a query, including those that have stopped reporting, use the following filter: system.last_signal=min:0.